2. Combine ground turkey, liquid aminos, pepper, onion, black pepper, and thyme in large bowl and mix thoroughly until all ingredients are well distributed. 3. Divide turkey mixture into 4 equal portions and form into burger patties. 4. Put on a plate; grab the 4 pineapple slices and head to the grill. 5. 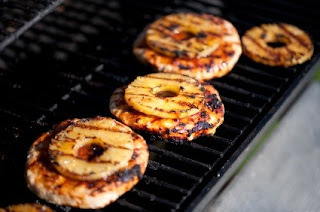 Place the burgers and the pineapple slices on the grill (the pineapple will cook for the same amount of time as the burgers to soften up and get that yummy smoky flavor). 6. After approximately 8 minutes, flip the burgers and the pineapple slices (the underside should be nice and brown). 7. After approximately 4 minutes, place one pineapple slice onto the top of each burger. 8. Cook for an additional 3-5 minutes, or until burgers are cooked thoroughly and no longer pink in the center. 9. Turn off the grill. Using a long spatula, carefully remove the burgers from the grill (don’t lose those pineapples!) and onto a plate. Per burger (makes 4 burgers): 185 calories, 33 grams protein, 9 grams carbohydrates, 2 grams fat. 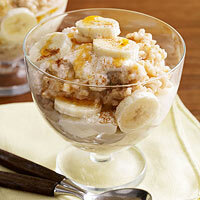 4 healthy crock pot recipes for breakfast! 1. Coat a 4- to 5-1/2-quart slow-cooker insert with nonstick cooking spray. 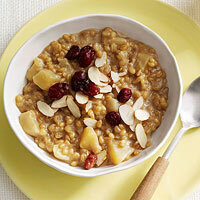 Combine almond milk, wheat berries, juice, apples, oats, cinnamon and salt in prepared slow cooker. 2. Cover and slow cook on LOW for 9 hours. Uncover and stir in brown sugar. 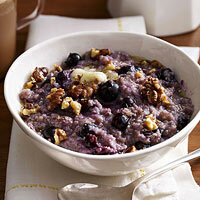 Spoon into bowls and top with sliced almonds and cranberries. Serve warm. 1. Coat programmable slow-cooker insert with nonstick cooking spray. Cook turkey bacon in a nonstick skillet over medium heat until just crisp, 9 minutes. 2. 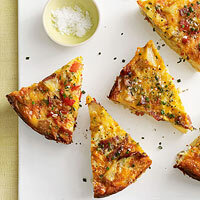 In a large bowl, toss together potato wedges, turkey bacon, red pepper, onion and 1 cup of the cheese. In a medium bowl, whisk eggs, milk, chives, salt and pepper. Whisk in Bisquick. 3. Pour potato mixture into slow cooker. Add egg mixture and top with remaining cheese. Cover and slow cook on LOW for 5 1/2 to 6 hours (machine will switch to WARM after cooking). Cut into wedges and serve.